Sorbothane� 40mm Isolation Spheres for Garrard 301 & Garrard 401 Plinths. This is the premium arm that UK HiFi luminaries have said "it's the best tonearm I have ever heard"
Available in 9" version for European and USA turntables, also in a 10" version for the Japanese super-decks and a 12" version for the ultimate turntable. 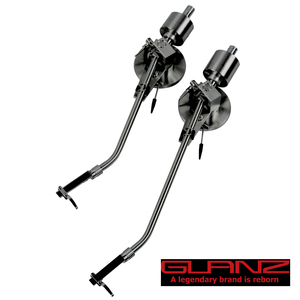 • To eliminate reverberating sound, Glanz do not use springs in the anti skate bias section. (Springs create an echo). • Glanz have blocked out reverberating sound with a powerful vibration absorbing/damping structure inside the arm tube and other structures. • Various parts are joined/connected across the surface, not just at points. The four fulcrums that support the sound quality are supported by four large bearings. In particular, the lower bearing in the direction of the vertical axis utilises high precision thrust bearings; it has a strut structure that allows heavy arms to move with high sensitivity. • The headshell structure is integrated with the plug section in one single piece, enabling the sound to rise well, resulting in crisp sound quality. • There are several layers of vibration absorbing/damping structure around the weight, delivering a clear, deep sound quality with little lingering sound. The material of the main body is made of hard stainless steel. The process of machining has been extremely difficult, but as a result, but we are proud to say that the sound quality has reached an unparalleled level. If the fulcrum, which is essential for sound quality, is a weak structure, it will reverberate and directly impact the overall sound quality. In this machine, the four large bearings are firmly supported, preventing resonance and shake, and enhancing tracing ability. In particular, the lower bearing in the vertical axis uses a high-precision thrust bearing, giving a strut structure which allows heavy arms to move with high sensitivity, greatly enhancing the tracking capability. The points where each part joins another are designed to be in tight surface contact to avoid using adhesive as much as possible. In particular, the assembly of the bearings requires meticulous sensitivity. We took pains to ensure that the curvature of the arm did not exert any additional force. This is easier to understand if you imagine how an extra twisting force is applied by your hand when you manipulate an L-shaped rod rather than a straight one. On top of that, we placed “vibration absorbing structures” in the most suitable place, thereby effectively damping the resonance. 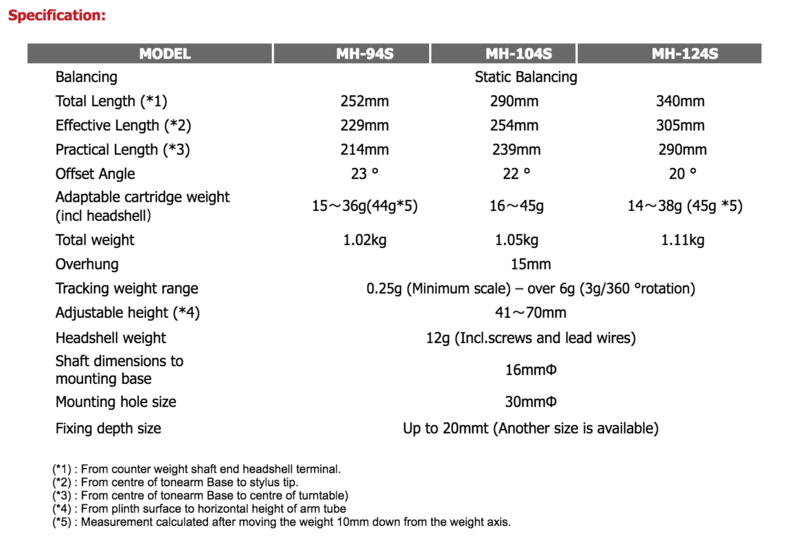 For the weight section we use different damper materials in 1, 2, 3 and 4 (for model SD), and these are constructed to absorb vibration over a wide area. The rubber material in 1 is firmly held in place by long screws, thus eliminating anxiety that it will become slack as it ages. By making the headshell into a single structure through the scraping process, we were able to greatly reduce vibration loss. Moreover, by trimming away unnecessary material as much as possible, we have devised a weight reduction similar to that of aluminium (although the material is actually stainless steel), resulting in an extremely light structure that can firmly support the entire cartridge. Rubber in the S Model and carbon in the SD Model both absorb unnecessary signals in the upper part of the structure. Because this slim design (just 10 mm in width, that can be supported near the very centre of the cartridge), can be connected directly to the centre point, the vibration loss is reduced and the sound quality is further improved.